Know what I've been wanting since the dawn of textures? A Black textured holo.. Doesn't have to be linear. Doesn't have to be the "OMG BEST HOLO EVAR"... 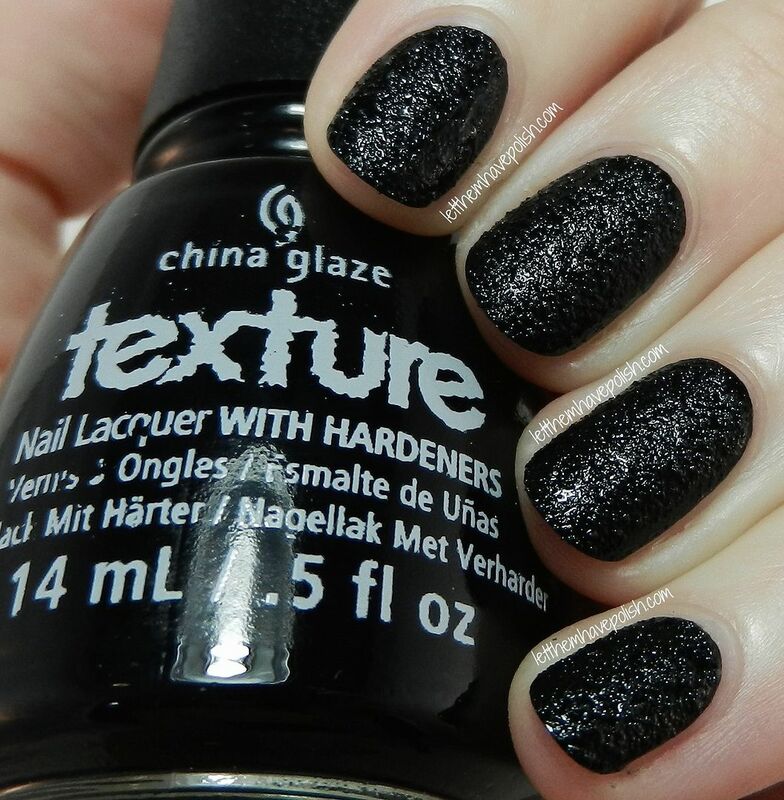 I just wanted something Black, textured and sparkly... SO.. I "made" my own ;D.
I started with a a base of China Glaze Bump in the Night. This shade is a super pigmented, true Black, texture. Bump in the Night is a creamy texture. Meaning, it has no sparkles whatsoever and dries to that cool stucco finish I love so much. Once I applied my Two coats of BITN I waited for it to dry thoroughly. It goes without saying that I did NOT top coat my texture. To give my Black base that extra holo punch I layered one thin and even coat of KBShimmer Prism Break over my texture. Prism Break comes from the KBShimmer Spring 2014 collection. This pretty holographic top coat gave me just the effect I was looking for. I didn't want the holo to take over the base, I just wanted it to give it a sparkly punch.. And a sparkly punch I definitely got. Layering the holo over a texture kinda "broke up" the holo and gave a cool scattered holo texture effect. 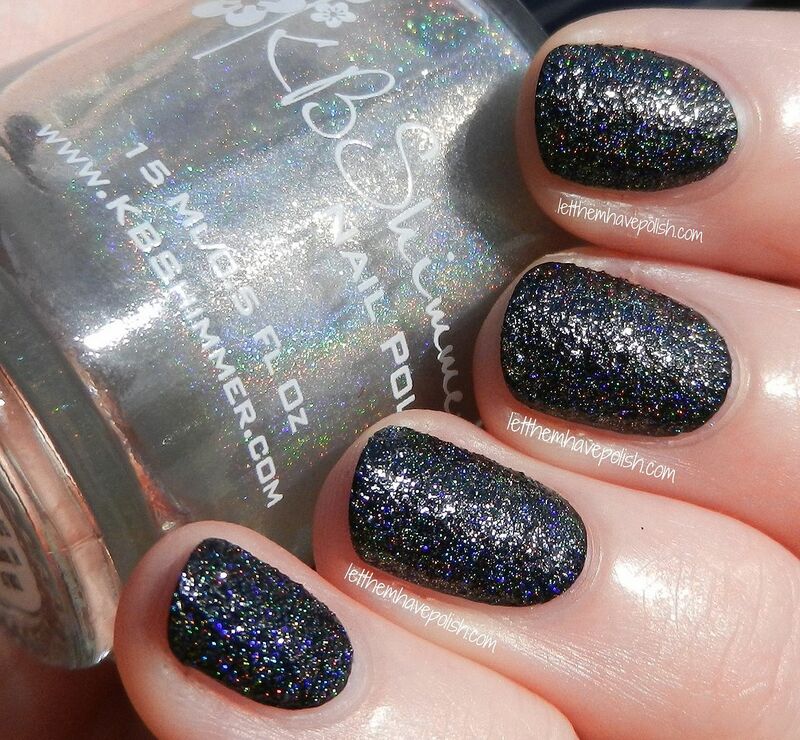 Since Prism Break is "thin" enough it gave me the perfect finish of a Black Holo texture. Prism Break was not thick enough to alter the bumpy finish of the black. Prism Break settled into the texture just perfectly. This is Bump in the Night all by itself. Still an amazing polish non the less. IDK why my skin looks so corpsey here... Black polishes can wash me out so bad :S... Anyhow, this shade has an incredible formula and could definitely be a one coater. Now I kinda want to layer Prism Break over all my creamy textures, just to see what happens. I really loved this layering. I love this! It's a really nice effect. What a great pairing together! That holographic top coat looks amazing too. Ermahgerd terxture and herler....this is awesome! I never would have thought to do this combo! Nice!! I didn't know KBShimmer had a topper like that. I have a lot of crème textures that every now and then I'd like to bling up. Great idea! Beautiful! Are the China Glaze texture polishes difficult to get off like OPI liquid sands are? I think I might need some!! That is SO cool! Really creative and a fun twist :). On a separate note, have you ordered from the U.S. Bettina distributor lately? I tried the email address you usually suggest, but I haven't seen a reply all week. Thank you. I have not worked with them in some time. I really dont know what is going on with their US distributor.